As the name suggests, these socks are a belated birthday present for my Dad. Although they are late I am pretty confident he will not mind — he seems to quite like hand knit socks. In fact, this is the fourth pair of socks I have knit for him, the third with this pattern and colour combination. The previous pairs of Dad socks were knit either using one colour only, or with contrasting ribbing, heels and toes. This time I decided to treat Dad to some stripes, using the spiralling stripe method (Ysolda has a good tutorial here). I quite like this method for knitting stripes in the round as there’s no jog to worry about. However, it did require working with a number of balls of yarn at once, which resulted in some major tangles. 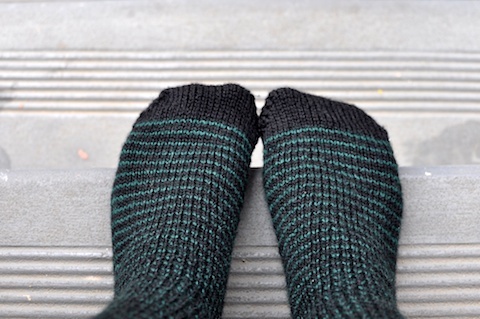 This pattern is my go to for plain socks as it is very straightforward. The yarn makes nice thick socks and has the advantage of knitting up very quickly relative to convetional sock yarn. Based on previous Dad socks, it seems to wear pretty well too. The fabric is probably a bit open, so next time I will use smaller needles. Speaking of next time, I will have to find a better foot model. There was a little bit of a goldilocks thing going on when I took the photos — Matt’s feet are a smidge too big for the socks and mine a smidge too small. I am sure Dad will appreciate me drawing comparisons between his foot size and a fairy tale character. Lovely stripes – they look great! Can we have a photo of where you changed colours please? I’m just curious. I’ve always been reluctant to knit striped socks fearing that the change of colour would make an uncomfortable bump inside the sock. They look very snazzy! I hope your dad loves them. they are really handsome socks!